Relax on this Recliner Chair after a long day. Featuring the stable structure of a Metal and Wood frame with extending leg support and thick armrests. Well padded with foam and finished in Black upholstery. A QUESTION ABOUT THE CHAIR PLEASE. We went into the Invercargill store to see the chair and the one with the same product number was different to this picture. 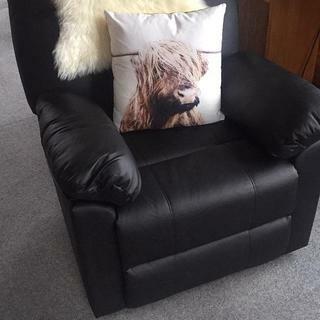 If we order this chair will it be the same as the picture above? We have had a two similar chairs from the Warehouse for at least seven years and they have been a really good buy and we would like to replace them. Jeff. Just wondering how much assembly is required for this item and about lifting and transporting it in its box? excellent replacement at a reasonable price. Wearing well. Sorry to say the wire cable that operates the leg rest has snapped at the operating pull handle. Can we get a replacement wire? Had one of these for around 18 months and it has always been kept out of direct sunlight and not had a lot of use. It is comfortable but the PU covering on the front of the arm rest pads has started to crack and peel off. Obviously poor quality PU has been used in these so called non wear areas. I would defiantly recommend this chair. They are so comfy and you feel cosy sitting in them.